There was a big turnout for Goalspecific athletes at IM 70.3 Staffs at the weekend and some awesome performances as the season starts to kick off. None of us were expecting the race to feature high temperatures before the swim start though! When you are looking to stand in the shade before the 7am swim start you know it could be challenging day! An interesting approach at Staffs to the wave starts where they decided to introduce a sub 5hr30min wave to start just after the pro athletes and Fran and Ray opted into it. The swim came up long as well so 33min was a good start for Fran and Ray’s 42min split is representative of a good block of bike and run training. Back to swim squad I think Ray . Wasn’t long until he was flying on the bike though, eventually posting a 2hr35min split. Great swim from Laura in 44min, Nige’s competitive instincts mean he wasn’t happy with 46min but it represents a huge improvement since starting coaching in January when 2 lengths in the pool was a struggle. Jenni and I started together, both with solid swims and Simon was in the last wave, posting a decent 39min swim. Fran was up to her normal tricks on the bike until a mechanical with the gear shifters slowed her down in the last 20km, but still posted the fastest split in her age group and led out on to the run. I somehow sneaked past Nige on the bike without either of us noticing and was fairly pleased with 2hr50min split on some fairly shocking road conditions with Jenni chasing me all the way posting an excellent 2hr55min split. Nige’s 3hr04min bike was a great ride hopefully showing those painful turbo sessions are paying off an Laura’s excellent 3hr20min split finally put the demons of Vichy 2016 to bed where a mechanical stopped her in her tracks 20 miles from transition. So all going well after the bike. Errrrrr…. not quite! Simon was flying after some great blocks of training and hit the hill at Cannock Chase looking at a sub 3hr bike time. However the temptation to pull a wheely off a speed bump at the top of the hill proved too great and he ended up in a heap on the road. So, an hour in a ambulance getting patched up and a person might have packed it in and headed for home. Not Simon. Back on the bike, into transition and out on the run covered in makeshift dressings. The run was very hot and slow but the spectators were amazing and particularly at the pub coming down the hill about half way round the lap. Ray finished with a brilliant 5hr10min time and 10th in the M45-49 age group – fantastic performance. Fran didn’t have the run legs this week but still managed a brilliant 2nd and another IM podium as the rehabilitation from surgery continues – still a way off 100% yet. Jenni ran into 5th in the 45-49 in 5hr43min in a very hard fought category, only 11mins behind the winner. I crawled in relatively happy, partly with a 5hr37min finish but mostly because I was still alive. Laura finished in a brilliant 6hr36min in 27th place in the 35-39 category – a great result in your first 70.3! The heat got the better of Nige on the run but he still managed a sub 7hr time – a huge improvement on last year, but plenty more to come from Nige. 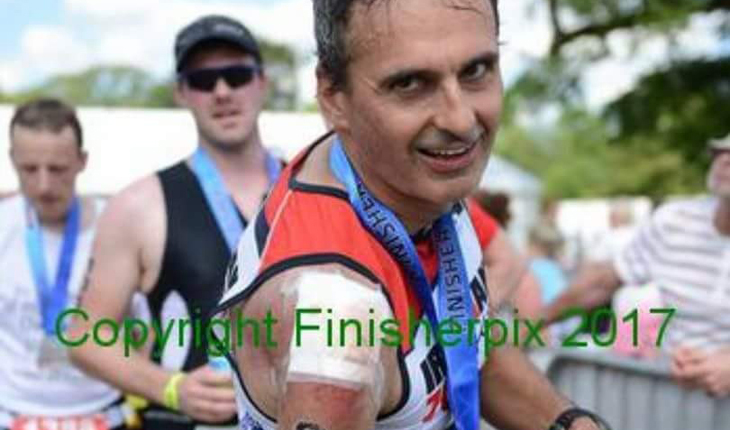 But perhaps performance of the day came from Simon for sheer guts, finishing with a 2hr run bleeding from his shoulder, hip and knee and still posting a 6hr49min time including a hour in the ambulance. Many thanks to the paramedics who patched him up! In an entirely different, but equally hot bit of the country, Dave Kelly was upping the open water distance at the New Forest Tri. Most importantly – a good swim and that was followed by a great bike – must be all the mountain climbing – and a solid run to finish second in his age group. More Goalspecific athletes are in the mix this weekend at 70.3UK Exmoor – Adam and Terri racing amongst others.